The following article by Eric Best was published in the July 6, 2015 issue of the Southwest Journal and updated on July 9. Minnesota Inc. for Northeast Minneapolis parkland, but passed it on to the full board for improvement. 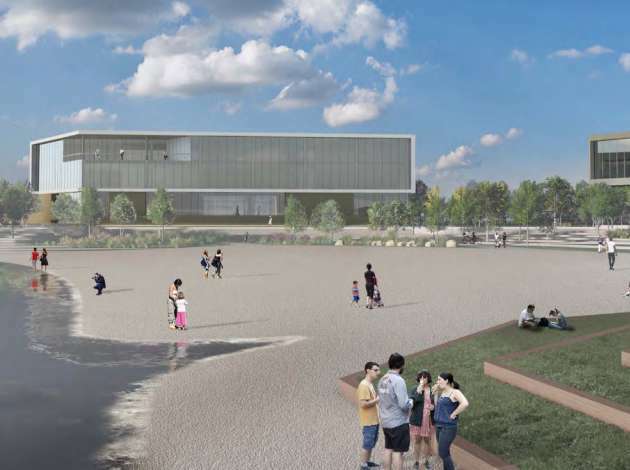 A Park Board committee approved the plans without a recommendation for a two-phase expansion of the industrial abrasive manufacturer’s riverfront headquarters that it submitted in June. Commissioners hope that Graco and its designers will improve the proposal before it comes before the board on July 15. Commissioners criticized the plans for poor public access and amenities, containing far too much surface parking at 283 stalls and for being too small to generate enough rent for a future park planned for the riverfront parkland, known as the Scherer site. Graco’s first phase includes a three-story, 50,00-square-foot headquarters building and 133-stall parking lot. The second phase would involve a second 50,000-square-foot building with additional above-ground parking. Graco expects construction would begin on the first phase in the second quarter of 2016 and wrap up by the second or third quarter of 2017. The second phase would commence in the third quarter of 2018 and be completed in mid-2019. If the board doesn’t give Graco development rights to the parcel, it will issue a request for proposals that will be open to other developers. The Northeast Minneapolis manufacturer tried coupling the plans to an easement deal it had been negotiating with the Park Board since the beginning of the year. Graco agreed to provide the easement in 2000 when it received more than $1 million in tax-increment financing (TIF) from the city to expand its fluid system manufacturing facility. However, the board and Graco did not agree on the terms of the easement. Those plans soured when Hennepin County District Judge John McShane granted a condemnation request from the board to obtain an easement over riverfront land owned by Graco in time for a looming federal grant deadline. The board will now move ahead with a nearly one-mile expansion of the East Bank Trail before a July 15 deadline when it would have lost a $1 million federal grant for the $1.6 million trail project. Though the exact cost of the easement is now being determined, the board has put aside its appraised value of $622,300. The long-planned trail will connect Boom Island Park with much of the Northeast Minneapolis riverfront. The pedestrian and bikes trails would be some of the first recreational paths on the river’s east bank and would be similar to West Bank trails the board created in 2007. Graco uncoupled the issues for a June 22 special board meeting in return for commissioners passing two conditions to block residential development and vacate a short stretch of 10th Street Northeast, but the board ignored its request, approving the easement without conditions in order to move forward with the condemnation process. A Graco spokesman said the company would’ve provided the easement for free if the board had passed its conditions. Graco’s development plans will utilize about two-thirds of the 3.6 acres of the Scherer site that the board intends for development. The board has owned the 11.4-acre site since 2010 when it bought it for $7.7 million with the plan of building a new riverfront park. Rent from the development would cover the park’s operating expenses, according to its master plan. For more than a decade, the board has acquired numerous acres of riverfront parkland in Northeast Minneapolis as part of its Above the Falls Regional Park master plan and RiverFirst initiatives, which began in 2000 and 2012, respectively. When complete, its trail project will provide an extension of East Bank pedestrian and bike paths along the river. Though the board’s committee moved the plans forward to the full board, they did so without recommendation and plenty of criticism. Graco spokesman Bryce Hallowell said in a statement that the company will continue to work with the board on its plans. “We’re interested in finding a solution that meets everyone’s needs,” he said. The company, with net sales surpassing $1 billion in 2012, has grown rapidly in the past two decades, opening facilities in Rodgers in 1996 and 2014 and in Anoka in 2006. Commissioner Steffanie Musich challenged the manufacturer to propose an expansion that will complement the site’s future park. This entry was posted in GRACO on July 13, 2015 by citoyen1789.